Using a map and compass. We're assuming that you'll be using Ordnance Survey Landranger maps or Explorer Maps, which are easily available and have a scale of 1:50,000 and 1:25,000. These maps give you an amazing amount of information and can not only show you the position of places but can also tell you about the type of terrain, the altitude, the incline, the way the land is used and even the history of the places. There are of course many modern gadgets that can tell you your position and display it on a map but they all need batteries to make them work and they can also be easily broken. 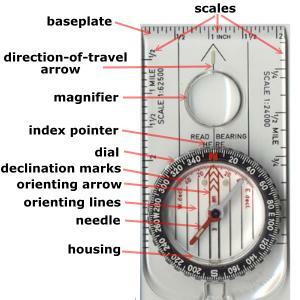 Why not learn to use a map and compass the old fashioned way so that the old-school method's always there as a back-up. There's a lot of symbols on an OS map and in time you'll learn to recognise most of them without having to refer to the legend all the time. In the meantime, there are only a handful or so that you need to familiarise yourself with straight away. The following are all used on the 1:50,000 maps but we suggest you also learn the symbols on the 1:25,000 maps too as they are slightly different. Take note: Footpaths are for feet - not for bikes. If you're on a bike then you must use bridleways and other rights of way intended for them. Learn the symbols for the features that make good landmarks, such as: churches, windmills, masts, electricity pylons and chimneys. Make sure you remember the difference between a church with a steeple and a church with a tower. In some parts of Sussex you can have about 8 churches in view at one time, so it helps to be able to tell them apart. Learn the symbols for the different types of environment, like woods, marshes, fields etc. As you can see, contour lines are always the same vertical height apart (check your map for the actual measurement), so the closer together they are, the steeper the incline. Click here for more help with contours. You also need to understand the symbols for public transport and roads. Most people agree that the best type of compass for hiking is the Silva type. Acquaint yourself with the different parts of the compass so that the instructional videos (below) make more sense. If you want some more help with the compass parts, click here. These three little videos by Silva explain how to use a compass in combination with a map. Aligning the map to north. Using a compass with a mirror gives you a much more accurate bearing on distant objects than using one without. This method is covered in more detail here. Taking cross-bearings from two landmarks so that you can find your position on a map. When you take the sighting, use the same eye every time and close the other. If you are right-handed, then use your right eye to do the sighting. It's easier to remember it that way. You can draw the lines using either side of the compass, it doesn't make any difference but if you use a biro on a normal map it won't come off. Buy yourself a chinagraph pencil instead. If you're going to be walking in Sussex then you'll generally be using well-marked, well-trodden footpaths, which of course are much easier to navigate than the wild moors and mountains of Scotland, for example. However, the principles are the same wherever you go, so gain experience of navigation on safe ground before you go venturing out to the mountains or the North Pole. For these jottings therefore, we're assuming that you're going to be walking in Sussex (and so you should too!). Study your pre-planned route on the map before you venture out, making sure that you're able to cross obstacles like railway lines, streams and rivers where you want to. Only the larger-scale Explorer maps show the small foot bridges (FB) over streams, which is a very handy thing to know when you are planning a route. Look for landmarks on the map that will aid your navigation when you're out in the field. When you know your starting position on the map (either by taking a crossbearing or because you already know where you are), when you've aligned the map to north, and when you've found the direction you want to go in, you'll find that navigation is a fairly simple process of following your progress on the map and making sure you take the correct turns. Problems can arise when you get confused about the scale of the map in relation to what you can see around you. You need to keep looking at the aligned map and comparing it to what you can see. If you're walking down a footpath and you need to take the second footpath on your left that heads north, then make sure you've already gone past the first footpath. That sounds straight forward, but if you're chatting and looking at other things, then you can easily miss the first signpost (which may be hidden anyway) and end up taking the wrong path. Check with your compass that the footpath is leading you in the right direction. Along many of the wooded paths in Sussex you can't see any distant landmarks, so you have to keep an eye on where you are. Remember that distances on the map are two-dimensional and a mile of steep incline will appear to be a much shorter distance on the map. Therefore, one of the first lessons you need to learn is - how far is a mile (or kilometre)? 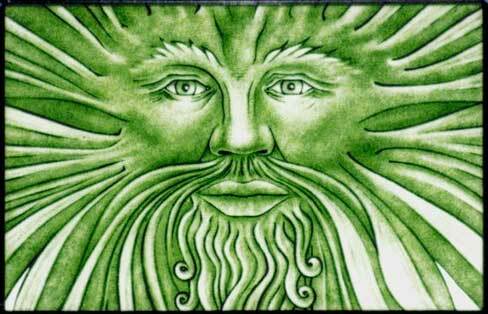 When you get this knowledge firmly planted in your subconscious you'll find navigation a far easier prospect. You may find that footpath signs are not always immediately visible, due to: overgrown vegetation, decay, breakage, vandalism etc, so you sometimes have to be a bit of a detective to figure out where they are and in which exact direction they are pointing. You'll find a lot of different types of signage are used along the same footpath, so don't convince yourself that you're looking for a wooden sign pointing the way when it may just be a small metal disc. This is where a pair of binoculars can come in very handy. You may become a bit daunted by some of the places that public footpaths actually take you through. They can send you through; private gardens, farms, factories, stables, airfields, MOD land... you name it! Don't worry about this at all, if the footpath sign says you can go there: then go there! Just make sure you stick rigidly to the footpath, respect people's property and privacy, and closely follow the Countryside Code at all times. People who have footpaths going through their property are very used to seeing confused walkers scratching their heads and are usually very friendly towards them, so don't panic. If in doubt, ask! The simple truth is, that the more you just go out and try navigating, the easier it gets. Sure, every now and then you'll go the wrong way, everybody does, but if you regularly check with your compass that you're going in the right direction, then you'll soon discover your mistake and rectify it. In Sussex it doesn't really matter if you get lost - you'll nearly always end up somewhere with a pub within 5 miles!